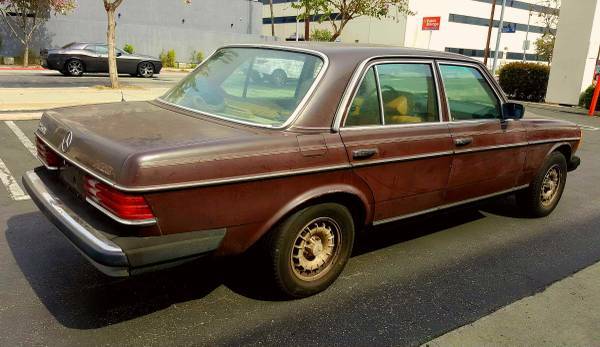 by Al -- Here is a chance to buy into the world renowned bank vault quality that is the Mercedes Benz W123 for less than 7 monthly payments on a new Camry. Anyone that was around in the 70s or 80s will remember their favorite dentist or math professor driving one of these. The low asking price and E-Z parts availability of these cars ensures that this one can be used as a daily beater without too much difficulty…well at least in cooler weather, as no mention is made of working AC. 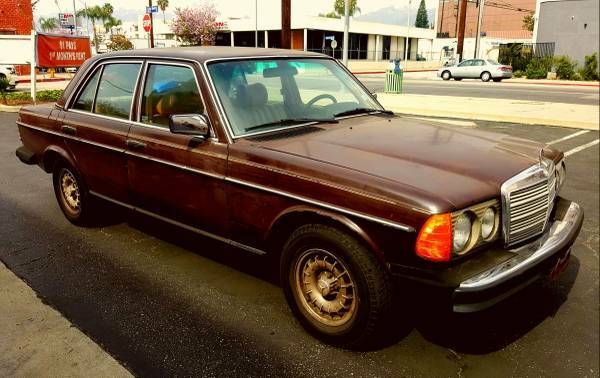 For Sale in the sunny San Fernando Valley in SoCal is this 1981 Mercedes Benz 240D with a 4-speed manual transmission offered for $2,500. The front shot of the car shows a beautifully straight (minor dings and dents notwithstanding) car with lovely Chestnut brown car that beautifully pairs with the car’s timeless lines. Some of the body panels have paint that is a little hazy…but if it is OG Mercedes Benz paint, an afternoon with some mild paint compound will bring out the shine like it was 1981. The W123 body style Mercede-Benz came in several different engine combinations, but the ones most likely to be around today are the 240D and 300D. This manual trans 240D is the one you want due to a much simpler vacuum system as compared to the 300D. Vacuum is used to lock and unlock the doors on the 300Ds…this 240D won’t give you those problems. The manual transmission will give you freedom from the eventual expense of rebuilding an ugly power robbing automatic. No engine shots are provided, but imagine a simple, rugged 4 cylinder engine under the hood with lots and lots of metal (not plastic) parts under the hood. As you never have to smog a diesel this old, you can remove the EGR system to clean up the appearance a little…while you are at it, if the cruise control doesn’t work, and you live in a densely packed area where it is of no use, you can remove that too. Once you get used to the big ol’ German steering wheel, big windows, great visibility and general panache of driving a sober German classic you can go look for a cheap 300D turbo with a busted auto trans, and swap that Turbo 5 cylinder into your 240D for big power (125hp instead of the 240D’s 70hp) AND the efficient manual transmission for max power. The interior shots provided show a generally clean tan interior, made from industrial strength MB TEX vinyl. The tan interior complements the dark brown exterior nicely...sort of like a chocolate and peanut butter Reese’s candy. The owner claims only 235k miles. If the mileage is correct this car should have plenty of life left with only a moderate amount of tinkering. This car has been languishing on craigslist for weeks and weeks…so the owner is probably going to be agreeable to some negotiation. I believe it was first being offered for $3900…I would try to get it for around 2000 bucks. Someone please buy this thing so that it quits tempting me. Al is an accomplished life long auto enthusiast. This affliction landed him in Detroit for several years working as an engineer in the auto industry. When he is not busy scanning Daily Turismo, Craigslist or one of the other fine car sites for great finds he works as an engineer on baggage tractors, or hones his tolerance for BS by landlording. Whoever thought of vacuum locks was an idiot. Oh...and vacuum climate controls, and vacuum smog equipment...and vacuum anything, really. How would we clean our floors? "benzmeister who sold it to me (RIP, Otto"
nah - redwood city actually - used a 911 to go fetch parts, said that was all it was good for - an SEC with a cracked dashboard was "junk"
Incorrect. My 82 240D came with vacuum locks which are connected to the diesel engine shut off system. When the locks fail due to a vaccum leak, you can only turn off the engine by hitting the red "Stop" lever under the hood. Freaked me out the first time this happened. Second time I could only turn off the engine by making sure all locks were in the down position. Back in '82 the vacuum system was more reliable than era electronics, so a good engineering decision in the context. Old MB mechanics understand all this. Intimately familiar with the 300D. I drove 2 of these for about 6 years, then graduated to the 124 300E, which was really a superior car. The 1st D I had was a 79 300TD wagon. As most of you probably know, TD does not stand for turbo diesel, it indicates a wagon. So, the '79 was a 5 cyl, non-turbo diesel. Slow it was, you had to plan your moves in advance, for sure. Heh, the comment on the faded paint, my wagon was bright red, when you buffed the heck out of it. I once took Maguire's Scratch X and, using two fingers, buffed the entire car, starting in the evening and working under lights until about 1 in the morning. Looked great, for about 3 months. Anyway, the engines are dead reliable, no tune ups, change the fuel filter occasionally and they run forever. The rest of the car, mechanical odometers stop working at some point, so mileage is always suspect. Cruise control usually doesn't work, vacuum systems leak after time, and have a lot of points to fail. Climate control units on the early models are suspect. A/C, if it hasn't been serviced, expect it not to work. The later 300D 5cyl turbo moves out OK, those 240's are horribly slow. 0 to 60 times are measured with a sun dial. I love the 240/300 prefer the 5 to the four hate ads that they say oh these motors will do a Million miles Hey if Joe Isuzu did not say it then its a Big Fat Lie......wink wink.....! I had forgotten all about old Joe, brilliant advertising, probably sold a lot of cars for Isuzu. I can say MB continued the beloved vacuum locking system into the 124 line, which worked about as well. Took me awhile to open the fuel filler door, which was locked on the same system as the doors. The manual release is in the trunk, which also would not open, for the same reason. Never mind the vacuum locking, the (no)vacuum engine (no)shutoff was always great fun in valet parking situations. Come back 2 hours later and the car is still running. 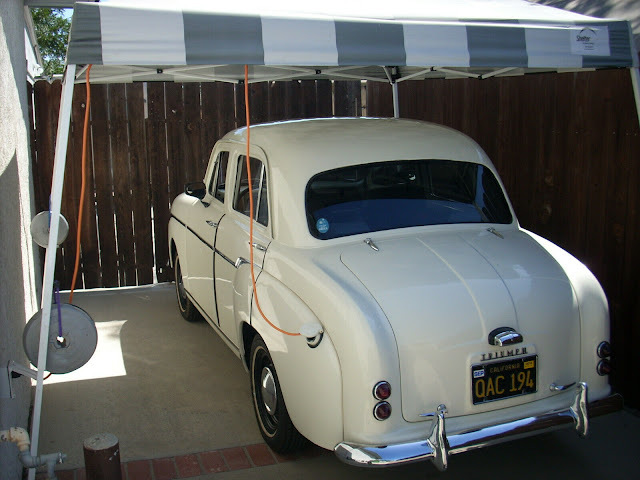 The only car more fun than that was a Chevrolet where if you shifted from first to reverse without shifting to second, third, or fourth on the way it might get in reverse and something else simultaneously until you crawled under the car with a pry bar to remedy the confusion. 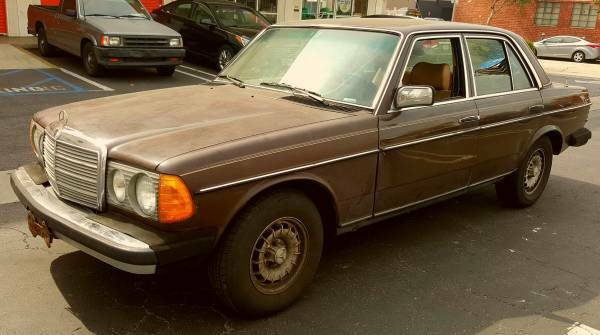 IN 1999 I bought an '81 240D with manual for my dad. 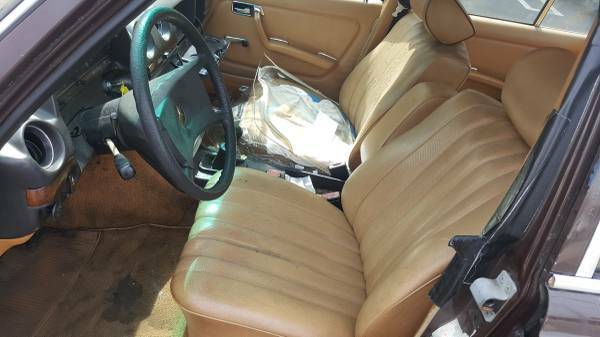 It was just north of 200k but it had the original grey paint with palomino interior. On streets this car did very well, the stick shift gave it a very euro flare but it annoyingly slow on the freeways. It had to be driven in the slow lanes unless you wanted to be the scourge of the traffic. Going uphill and passing required a lot of mental involvement. I learned to hate merging motorists and surprise elevation grades while driving in the 240 on the freeway. These are not as bulletproof as people like to describe them. Sure, back in its day almost any average car with over 100k on the odo was considered a potential candidate for pick-ur-part the Merc diesels looked like they could run forever. My dad's car engine gave up a ghost at around 300k miles, still no small feat but... The used replacement motor didn't feel right and eventually my dad went on to sell it.